1645. When Alice Hopkins’ husband dies in a tragic accident, she has no choice but to return to the small Essex town of Manningtree, where her brother Matthew still lives. But home is no longer a place of safety. Matthew has changed, and there are rumours spreading through the town: whispers of witches, and of a great book, in which her brother is gathering women’s names. To what lengths will her brother’s obsession drive him? And what choice will Alice make, when she finds herself at the very heart of his plan? This book was all the best things that you can find in a historical fiction novel. It immediately appealed to me because the 1600s witch hunting is a phenomenon that has always intrigued me, probably due to my own pagan leanings. This book was everything that I hoped that it would be and more. 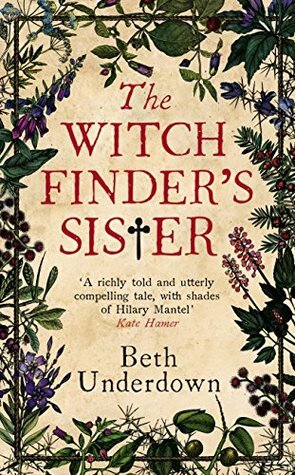 Firstly, the book is told from the perspective of Alice, fictional sister of Matthew Hopkins the infamous witch finder general. It’s a story about the lives of women from the perspective of a woman, it talks about being at the mercy of the men in their lives and other factors which made them vulnerable to accusations of witchcraft. Alice is an excellent narrator for this story, she’s a kind, educated woman who has lost everything she once future on. She’s returned home after the loss of her husband and is now at the mercy of her unstable younger brother who has moved up in the world in her absence. What makes her so perfect is that she is part of the proceedings while at the same time set apart from them so that she can see everything that’s going on. Underdown is a storytelling genius, she’s a master of the art of subtlety and has found the perfect balance to make the language come across as authentic without being face meltingly dull as I’ve learnt to be wary of in historical fiction. She weaves in some of the possible psychological causes of the witch hunts, ranging from grief over the loss of a child, mental illness, fear and greed. The most interesting part for me was when Alice, even tempered narrator that she is, was jealous enough of another woman that she couldn’t fully disagree with her being accused of witchcraft. This book kept my attention all the way through, the second half picked up the pace and shifted from ‘sad’ to ‘downright traumatic’ as Hopkins’ activities start to escalate and people just let him destroy the peace in their villages and torment their most vulnerable women. What makes it so harrowing to read is that the author has clearly done her homework on the history… which means that these events are based on a true story. Regardless of motive or the specifics, dozens of women were tortured, abused and hanged for witchcraft during this time frame. If you like historical fiction or have even a passing interest in the 1600s witch hunts, pick up this book and read where it all began before the hysteria travelled overseas to Salem, Massachusetts. From this point on, I’ll be picking up anything written by Beth Underdown and relishing it! I love recommendations for great historical fiction, so thank you! 'Bookworm' doesn't even begin to cover it. Here to support independent authors, small presses and hidden gems.